Lose the leash + gain peace of mind. When it comes to buying dogs for protection, keep in mind that you won’t be relying on tactical commands every day. We want our clients to be safe when the unexpected happens, so we give each dog the most functional and effective training available in the industry. At the same time, it is important to us that our dogs add value to homes every single day by being exceptional companions. Our training is designed to be an easy fit into your day-to-day routine. Simple, unnoticeable and seamlessly integrated with the normal routine. Our dogs play fetch, go for a swim, follow you on a run and sit back for a movie, just like dogs you’ve had in the past. The difference is that our personal protection dogs will give you unmatched obedience from day one, along with an unprecedented confidence in your safety. The obedience component of your protection dog’s training is vital. It’s not until you spend a day enjoying your new dog’s perfect recall and attentiveness that you begin to understand that our personal protection dogs are also fun to have around. Our trainers teach every dog commands that will become the basis of your everyday relationship. Our most popular off-leash exercise is one that comes with every dog: relaxed heel. This one command will keep your dog walking within a few feet of your body without the need for a leash. This is a versatile command that you’ll use for taking your dog out to the bathroom, going on a hike, finding your way through crowded cities or just hanging out around the house. Some people are afraid of large dogs, either out of instinct or experience. If while out with your dog, a person approaching you appears nervous, you can casually put your dog into a command such as sit, down or beg. This demonstrates to the passersby that your dog is friendly and controlled, and will not harm them. Our dogs are trained to respond to commands said once, in a normal tone. You don’t have to strike a pose in front of your dog and yell, “Sit! Sit! Sit!” to the amusement of onlookers. 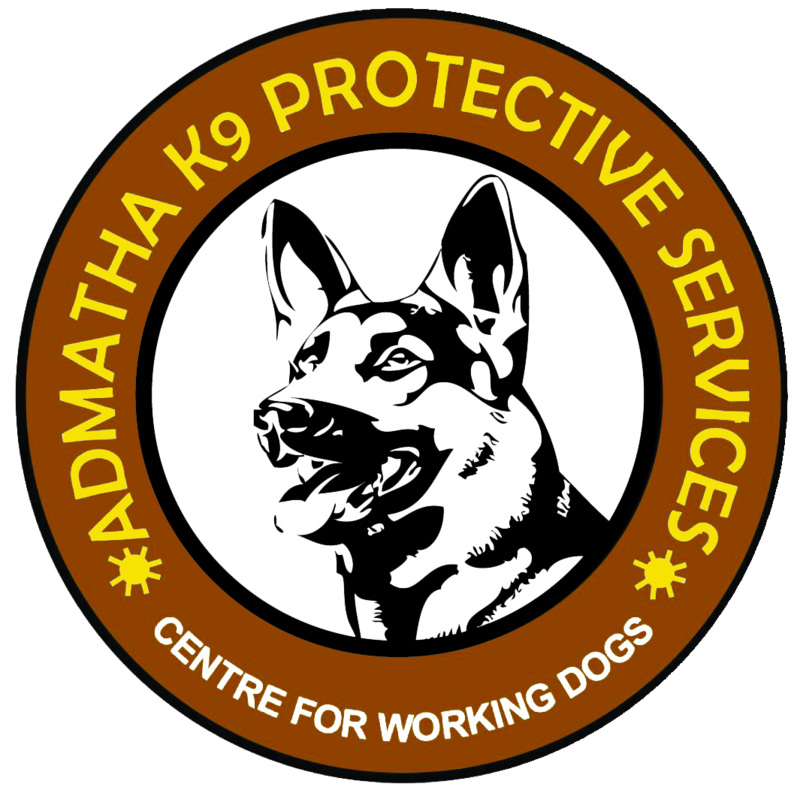 Dogs have great hearing, and humans have other things to worry about, so at Admatha K9 Protective Services, we believe in keeping things simple. The best home protection dogs are as quick to “lie down” as they are to charge an intruder. When we come to your home to integrate your personal protection dog, we will provide you and your family members with a complete understanding of your dog’s training. You’ll understand the psychology behind it and have all of the tools you’ll need to keep all of the obedience and protection training sharp. These techniques become second nature, and without realizing, it you’ll be reinforcing your dog’s training every day. If you’d ever need a little extra help from the experts, you can call on us at any time.